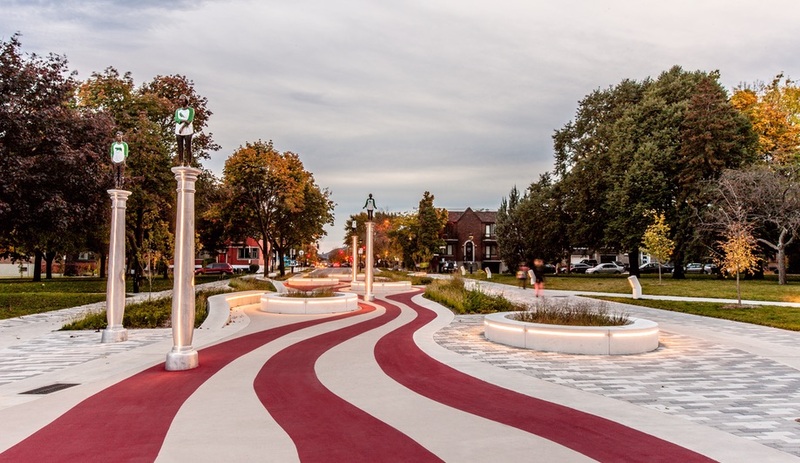 In Montreal, local landscape architecture firm Civiliti has designed Parc Guido-Nincheri, a public art-filled space defined by undulating red and white striped pathways. Montreal residents have always had a fondness for the neighbourhood of Mercier-Hochelaga-Maisonneuve. For good reason: it’s where you’ll find architect Roger Taillibert’s beloved Olympic Stadium, the doughnut-shaped building that once served as the Montreal Expos home field. Blocks away, the city’s Botanical Gardens – which includes the ever-popular Biodome and Planetarium – injects 75 hectares of green space into the urban environment. And bordered by Angus, Sainte-Marie and Rosemont, it’s a surrounded by well-traversed residential neighbourhoods. It wouldn’t be wrong, then, the call Mercier-Hochelaga-Maisonneuve a nexus. 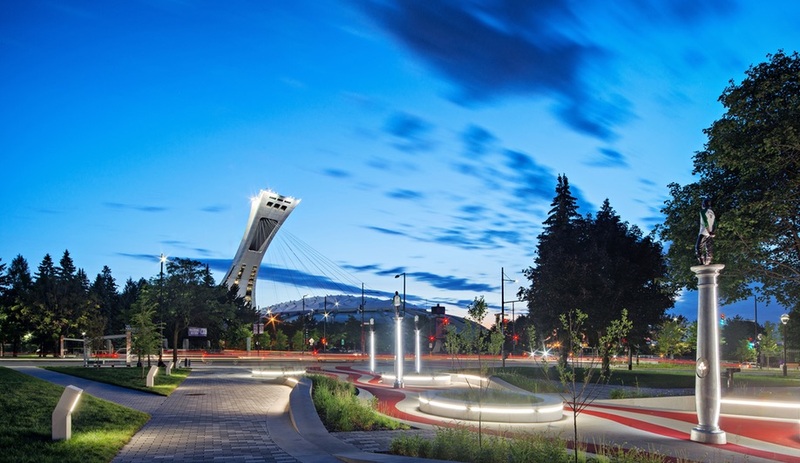 So when local landscape architecture firm Civiliti was tasked with redeveloping a park at the intersection of Pie IX and Sherbrooke, it developed a gateway to the neighbourhood. One filled with attention-grabbing public art. 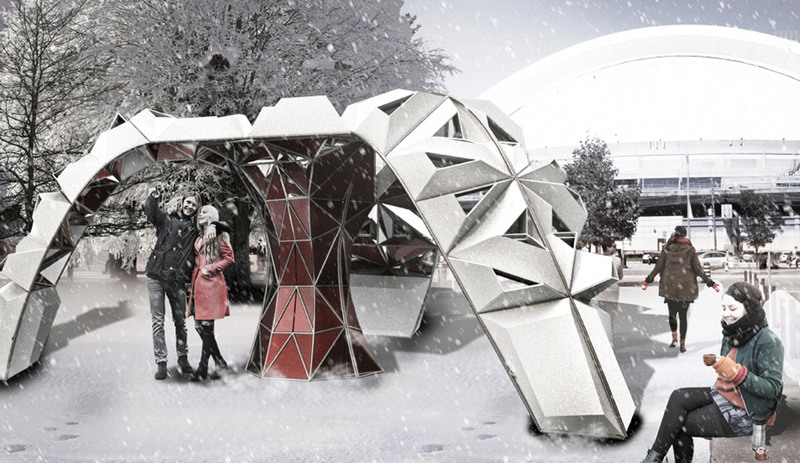 Civiliti was selected to redevelop the park space as part of Alive 375, a project aimed at shaping Montreal’s future. 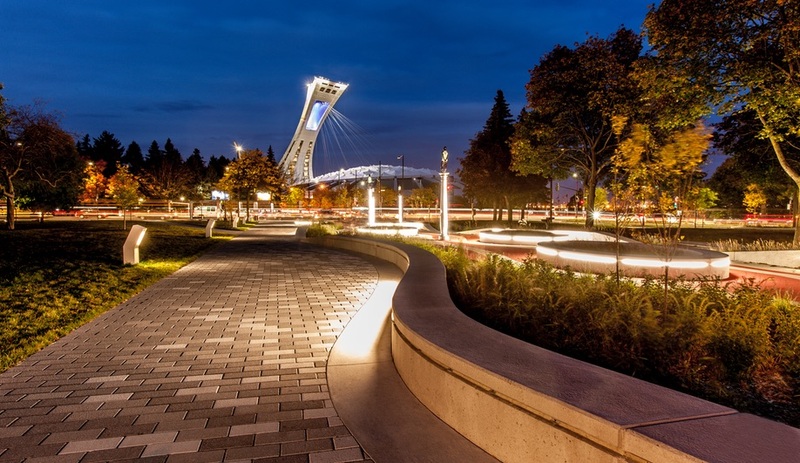 Part of the city’s 375th anniversary celebrations last year, the initiative has brought a number of public legacy projects, such as the makeover of Parc Jean-Drapeau, the covering of the Ville-Marie autoroute and Moment Factory’s illumination of the Cartier bridge, to the city. 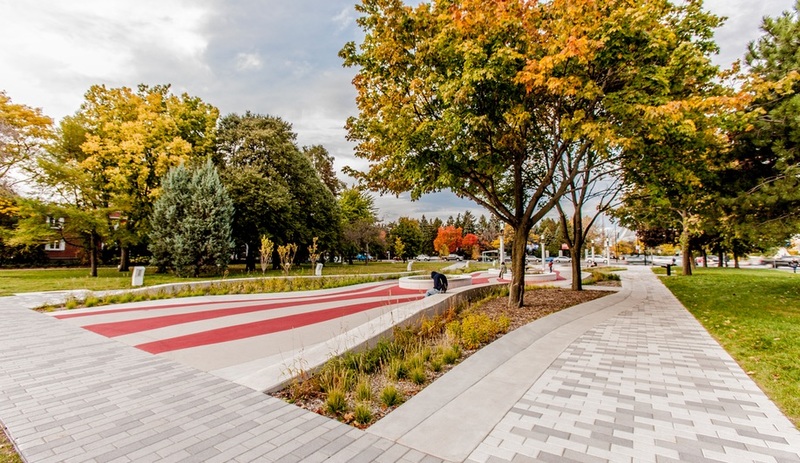 Tasked with turning the busy, but hardly pedestrian-friendly, Pie X-Sherbrooke intersection into a green space, Civiliti achieved its first step by merging two parks that were previously bisected by heavily trafficked rue Rachel. The master plan also widened the entrance to the Botanical Gardens – a move that beckons even more Montrealers within. 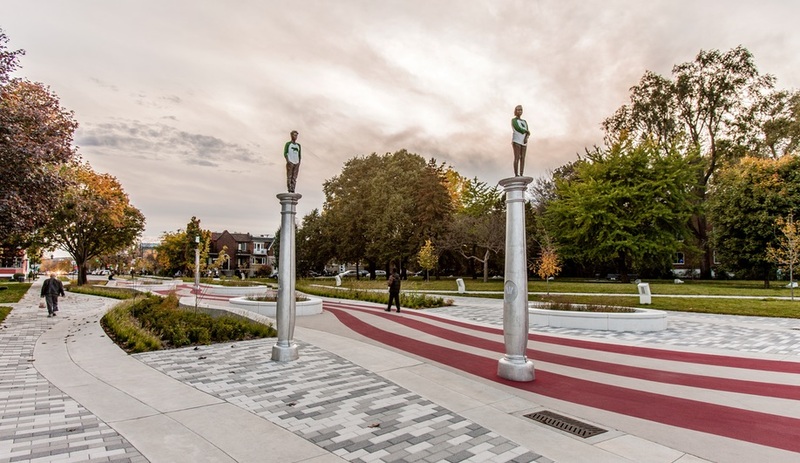 The resulting space is Parc Guido-Nincheri – a title Montreal’s Italian community lobbied to preserve – named for a Canadian artist known for his fresco paintings and stained-glass work. The first thing one notices upon entering the park is a crisscrossing promenade that resembles a red-and-white candy swirl. But in developing the pathways, Civiliti wasn’t think about confectionary – rather, these arteries were inspired by tree trunks. 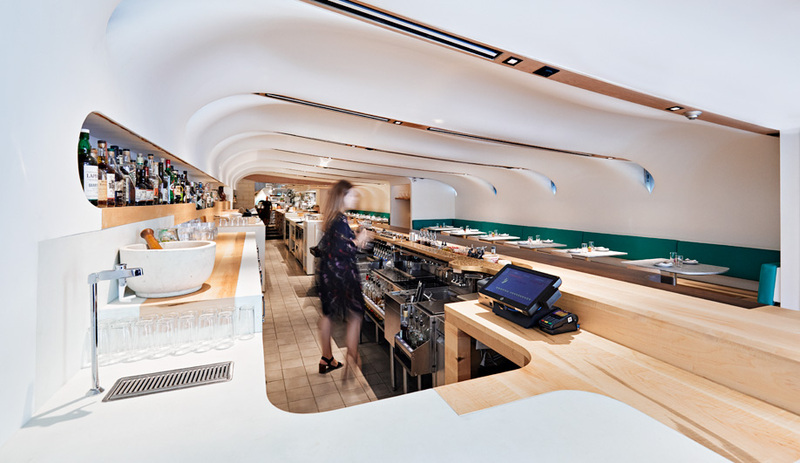 “The prime source of inspiration was the image of a tall tree trunk, cut lengthwise and laid on its side,” the firm says. “Undulating red lines running through the entire length of the site allude to the sap flowing up the trunk.” As sap carries nutrients to a tree’s limbs, the reasoning goes, these arteries safely deliver pedestrians and cyclists – who have a dedicated track traversing the park – to the surrounding neighbourhoods. Raised circular planters (above right), illuminated by lights provided by UDO Design, are meant to resemble a tree’s knots. 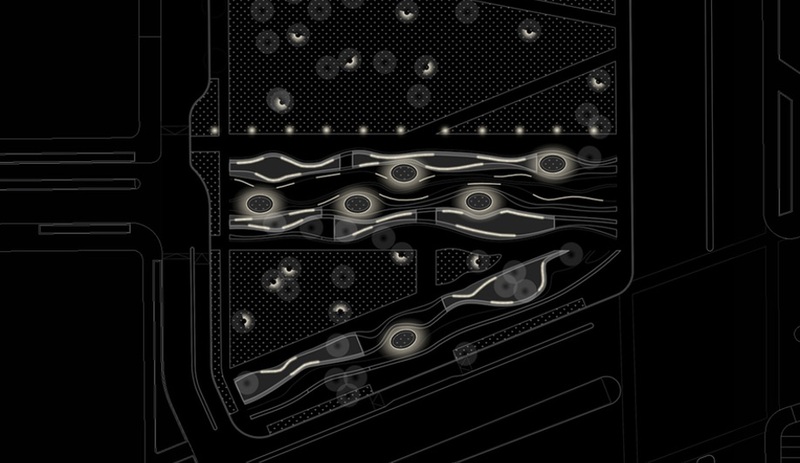 Elements of lighting, seating and vegetation was carefully considered to highlight the park’s natural features. Although it’s less visible, surface gutters zigzag the site, diverting rainfall into catchment basins. Inside the park, the painted pathways and lit-up planters are undeniably bold. 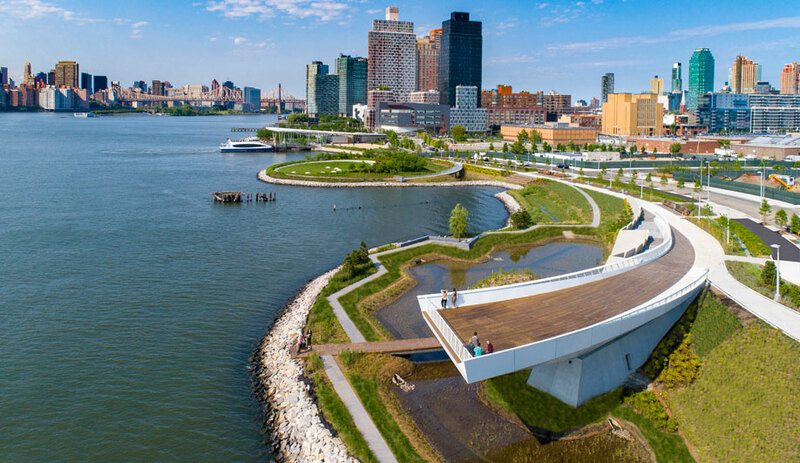 But Civiliti also used low-lying curvilinear walls to border the park, which it describes as “defining the trunk’s outer limits.” It also creates a subtler transition to the surrounding neighbourhoods. The quirkiest part of the park, however, is a sculptural work from artist Jean-Robert Drouillard. Donated to Montreal by Quebec City, his installation features four columns topped by young people wearing baseball jerseys – but despite the proximity of the Olympic Stadium, this isn’t a tribute to the Expos. Each statue’s shirt features native flora and fauna on the front, and a historical date on the back, pointing to key events in Montreal and Quebec City’s history. 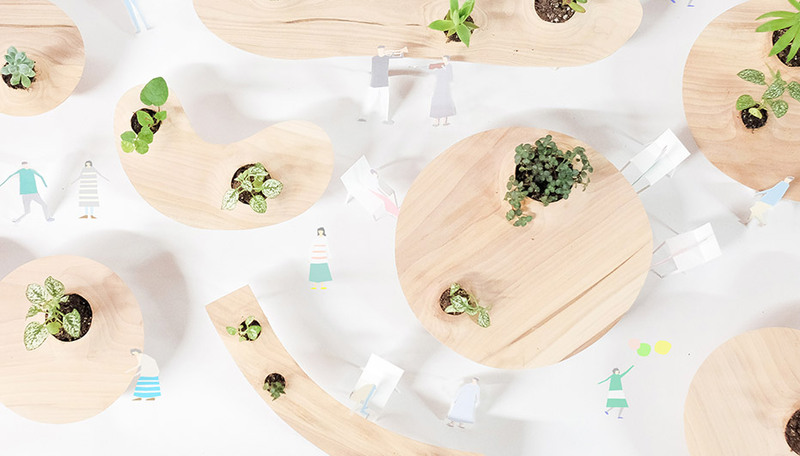 The sculptures – and the perpetual kids atop them – are meant to keep Montrealers fixated on the future. For Civiliti, this isn’t the only green intervention on the horizon; the firm is also working on the Saint-Laurent Biodiversity Corridor, aiming to bring more parkspace to another Montreal neighbourhood. Here’s to many more.